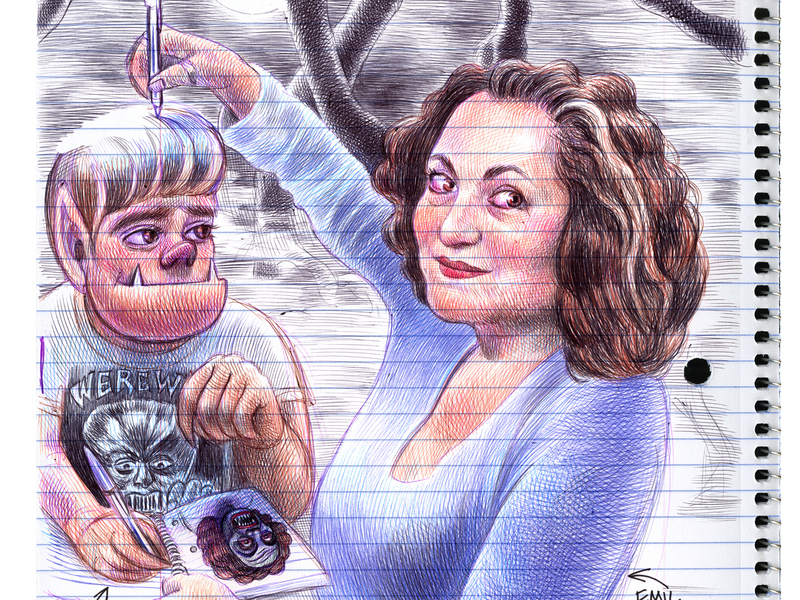 'Every Full Moon We Can Howl At Is A Victory,' Says Emil Ferris Ferris' graphic novel My Favorite Thing Is Monsters won three Eisners, the highest award in mainstream comics, and it celebrates the things that make us all monsters — because monsters are cool. 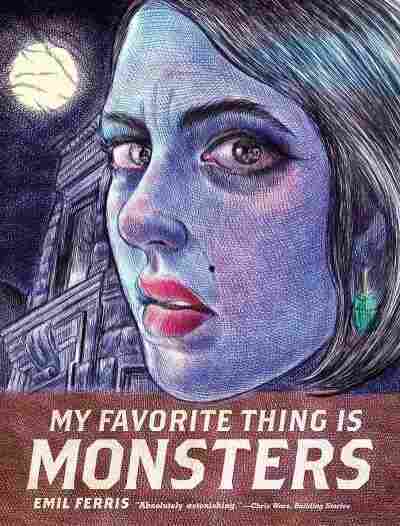 Writer and artist Emil Ferris won three Eisner Awards — the highest award in mainstream comics — for her graphic novel My Favorite Thing is Monsters. It's a huge tome, full of inky, scratchy drawings done in ballpoint pen, ranging from loose sketches to lovingly rendered covers of pulp horror magazines. Ferris says that when she started My Favorite Thing is Monsters — her first graphic novel — she had no idea it would be so massive. "It just sort of came out of me and began being this larger world." That world is 1960s Chicago, a world full of mystery and murder, seen through the eyes of a horror-obsessed ten-year-old girl named Karen. Her notes and drawings make up the backbone of the book, and they detail Karen's investigation into the murder of her mysterious upstairs neighbor, Anka. But Ferris says it's about so much more than that: "I think the book is really about accepting the monster in ourselves." 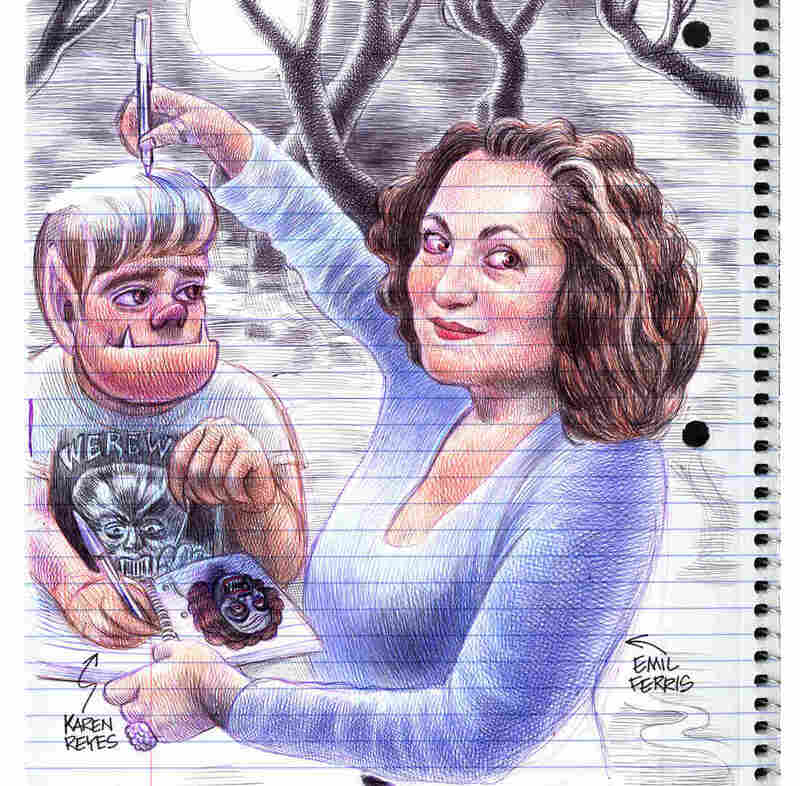 Karen draws herself as a werewolf, shunned — even hunted — by villagers. It's a classic monster movie trope, that Ferris says reflects what happens in reality. "You have the villagers and their torches, it's nighttime and they're coming and hunting for the monster, right? And you have the Third Reich, and you have the same picture. And then you have Charlottesville, and you have the same picture. We would be a different world if we didn't have the villager mentality, if we realized we were all monsters." For Ferris, what makes us monsters are the qualities that set us apart from everyone else. She says she's been fascinated by monsters since she was a child, when her disabilities kept her from playing during recess. "I understood that there were physical things that made the monster different, as there were with me, and then as I became more aware of my sexuality." Ferris identifies as bisexual, and says "that was another layer that I realized would quality me for monsterhood, and I embraced it — because the monster is cool! And has an arc!" Then, 15 years ago, when she was 40 and her daughter was six, Ferris contracted West Nile Virus from a mosquito. The disease left her mostly paralyzed, and unsure of her future. "My chances of recovery were not being sold to me as very great, but then I had my daughter, who said 'Don't listen to them, listen to me, you're going to get everything back.'" Shortly after she returned home from the hospital, Ferris' family put together an art show and she wanted to have something new to contribute — a portrait of herself, she says, blighted by the illness. But she wasn't able to hold a pen — which left her on the verge of tears, until her daughter duct-taped the pen to her hand. "And she said, 'Do it anyway.' I mean, here's this little six year old who's so strong," Ferris remembers, "and she would move my arm and dip it into the inkwell and I would bring it back, and it was so hard, because it would flop down, and some of the drawing I did, there were blurps of ink." We would be a different world if we didn't have the villager mentality, if we realized we were all monsters. But she finished the portrait, and her daughter drew two figures at the bottom ---one of herself sitting in a little chair and one of Ferris. "She drew me getting up out of the wheelchair, because she said, 'That's what's going to happen.' And at the time I couldn't — but that little girl believed I could, so I did! There's the power of little girls, right?" Ferris says after lots of physical therapy and hard work, she's regained much of her former ability. And My Favorite Thing is Monsters is a testament to that work. "Every drawing was a victory and every drawing was imbued with joy," she says. And, she says, she wrote this book for those like Karen — her precocious, werewolf-y protagonist — who sometimes need help howling. "Every full moon we can howl at is a victory over the villagers."